Surgeries started today. We continue to have more people come to the hospital, hoping to get their life changing cleft surgeries. The decision was made to accommodate as many latecomers as possible. In the hall outside the screening room, where the decision is made if the individual is a good surgical case, people waited four and five deep. Some were from the day before, who were there to be admitted for surgery. Some were there due to the regular flow of patients seeking treatment at the hospital, and some were the thirteen additional patients that hadn’t been screened on Sunday, our designated screening day. Along the wall waiting was David, who was one of the most disfigured patients we had screened on Sunday. As a child, he had a bad infection on the right side of his face, known as Noma, that exposed many of the teeth. The flesh-eating virus had taken most of his lip, and some of the cheek, leaving tight, constricted scar tissue that prevented him from opening his mouth more than about the thickness of 2 dimes. The teeth protruded badly, and were not functional. Being exposed, the teeth gave him the look of a skeleton, without any skin covering. David has lived this way most of his 21 years. We decided that removing the teeth would allow him to look more normal and brush better. He wouldn’t be able to have surgery for his cleft because he couldn’t open enough to allow a breathing tube to be inserted. After we removed his upper right front tooth, and some on the lower right, he lost the skeleton look. We will see him again on Friday to remove the stitches we placed. I am anxious to see the healing and photograph the change. 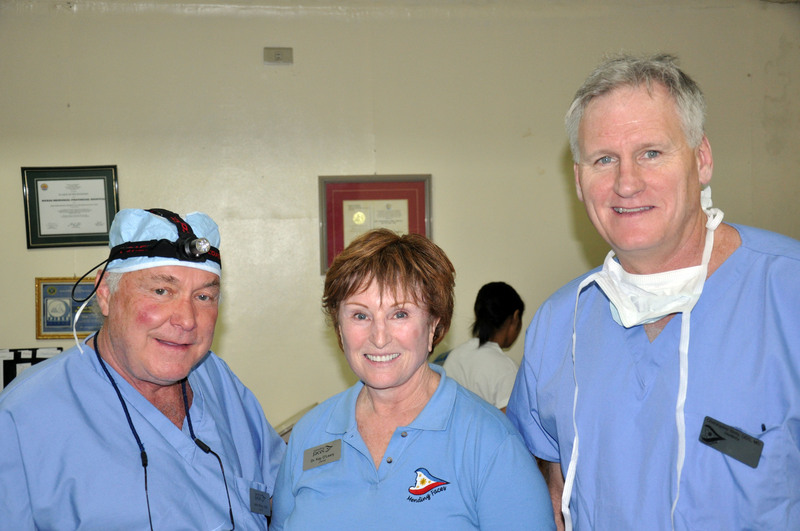 Most of our cases have clefts before, and are repaired to normal after the surgery. 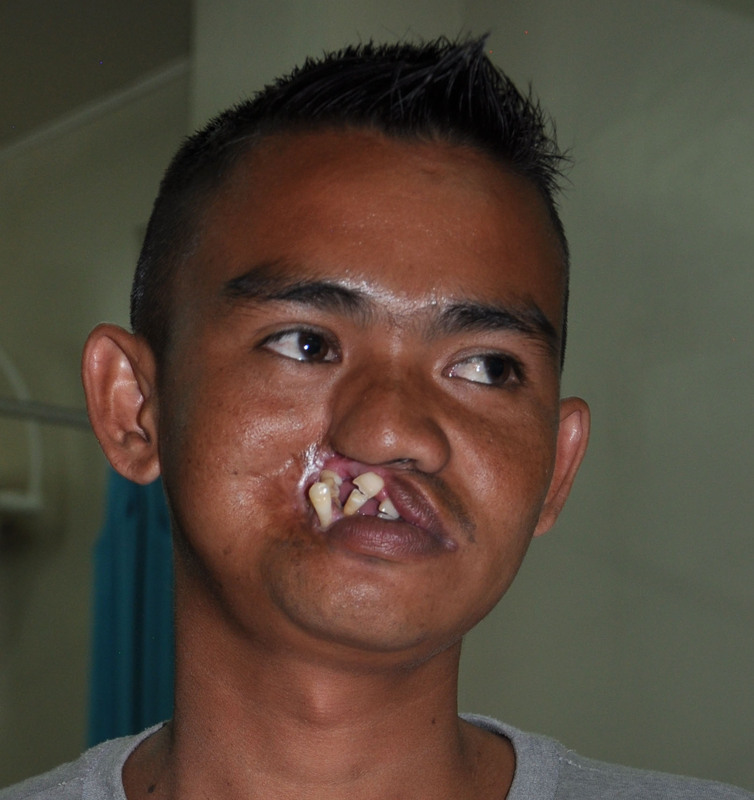 David will not have the pretty look of a repaired cleft due to the large defect. But, having those teeth removed should allow him to feel more normal, and less like people are focusing on his unusual appearance. We also saw a young man whose cleft lip had been repaired, but the palate remains open to the floor of the nose. He has a small retainer with 2 front teeth on it, which normalizes his smile, but does not keep food from going up into his nose when he eats. It also does not help him make sounds that require pressure such as “B”s and “P”s. We took an impression with a soft material that gave us the shape of the defect in the roof of his mouth. From that, an appliance that covers his palate and seals the opening will be made, incorporating the missing two front teeth. He will come back tomorrow to have the obturator placed and fit, so we can make any necessary adjustments.